Arpeggios are related to chords although the notes are never played simultaneously like a strummed chord. Arpeggios are more similar with finger picking, and if you sometimes play single notes using chords you have most likely played arpeggios without knowing it. To explain better, we can divide chords, scales and arpeggios by give each a definition. Chord – a couple of notes that are played together, either by strumming or by picking some of the notes. Scale – a set of tones, that for example can be used as a framework for soloing. Arpeggios – a set of tones that are included in a certain chord, but that can be expanded outside the chord shape. To illustrate the main difference between a chord and arpeggio we can look at these to diagrams. The first is a C major chord and the second is a C major arpeggio. The second diagram above repeats the notes that belongs to the C major chord: C, E and G. It marks all C, E and G notes that could be found on the eight first frets plus on the open strings. So, if you play a random pattern including some these tones, you will play an arpeggio in C major. The same thing can be done with other major chords … and with minor … and with major seventh … and so on. Here you can learn more about arpeggios including sound examples. Since this is just an introduction of the subject, you will not find a complete presentation of diagrams. 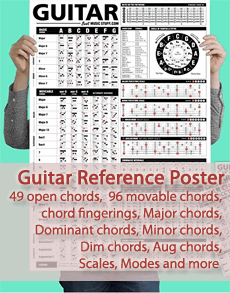 Instead, Guitaristsource.com could be recommended, where you can find more diagrams in major and minor. If you are not familiar with the notes on the fretboard and find it overwhelming to learn it, it shouldn’t stop you from playing arpeggios. In the opposite, arpeggios can help you learn the fretboard. If you don’t know the all the notes, you can start by learning on or a few of the C notes. When you know the position of a C note you can move up four frets and you will find an E note – this will happen regardless where on the fretboard you start (as long as it is on a C note obviously). And then you have landed on an E note you can in all situations move three frets up the fretboard and land on a G. And now you may ask: how many frets from G to C? The answer is five. You can try this for some major chords (the intervals are not the same for minor), and you will learn to play arpeggios and understanding the fretboard on the same time.